This is the back story to the book Conversations with Taiichi Ohno. Why write a fictional account of conversations with Taiichi Ohno (1912-1990)? There are a several reasons for doing so. The first reason is that people are losing touch with Taiichi Ohno. They don’t know who he was. They don’t know what he did. And they have not read his books. Ohno-san is in danger of being forgotten as the years go by. The second reason is that I have long felt that Ohno’s work has been poorly understood, even by those who carefully study and write about Toyota. Aspects of Ohno’s unique way of thinking and many elements of his work remain unknown, poorly known, or misunderstood. And people easily miss many important details that lie at the heart of TPS. The third reason is that because people have a poor understanding of the mindset and management practices associated with the Toyota Production System, they have been unable to establish or create something similar to TPS. The fourth reason is that Ohno’s work, as manifested in the creation of the Toyota Production System, anticipated the digital age. In other words, TPS is more suited for the 21st century than it was for the 20th century. The fifth reason is to help keep Ohno’s work alive in an era where people scorn and mock innovations from the industrial era, for no other reason than the innovations were made in the industrial era. As a result, they fail to see how such innovations apply to the digital era. The sixth reason is that the importance of Ohno’s work remains poorly recognized outside of a subset of the small community of people who practice TPS and its variants such as Lean, Lean Six Sigma, and so on. 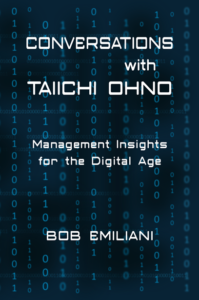 Others such as business leaders, economists, educators, the business press, and government officials would benefit by learning more about Taiichi Ohno’s work. The seventh reason is that people have become obsessed with disruptive technologies and see that as the only pathway to success. Ohno reminds us that good thinking, steady work habits, daily improvement, and long-term commitment to a purpose remain necessary now and into the future. I thought a conversational style of writing would be an effective way to address the various reasons for writing this book. So, you may ask, “What makes you the expert to tell us about Ohno’s work?” I am no expert in TPS, as I say in the Preface of the book. My efforts to educate and guide people always contain mistakes. Nevertheless, I hope to take my knowledge, accumulated over the last 25 years, and channel Ohno’s way of thinking so that people can more easily understand the purpose and meaning of TPS, and why its true home is in the digital age. Conversations with Taiichi Ohno is not a discourse on the technical details of the Toyota Production System. Rather, it is an exposition of the management thinking, practice, and decision-making that enables TPS to be established and evolve. In doing so, the practice of management improves, keeps up with times, and does good things for people. I hope you like the book and that you find it useful. Love it. Look forward to reading. I ‘though’ a conversational style of writing would be an effective way to address the various reasons for writing this book. Hi Mark – Thanks; I fixed the typo. The book should be available on amazon in a few days. Hi Bob – I hope the book meets expectations. I will be happy to give you a discount. I’ll contact you with the details. I have been a self-taught student of Ohno and TPS (among other areas including WCM, TOC, ISO etc) for about 12 years and I keep coming back to “Workplace Management” for inspiration, quotations and simple – but deep – understanding. Leading the charge in a relatively small company in the west of Ireland is far from what Ohno did, but I try to approach my work with his philosophy in mind. I look forward to reading this one. Thank you for continuing to share your knowledge. Hi Simon – Thanks for sharing your interest in Ohno-san’s work and your efforts to apply his thinking at your company. I hope you like the book. I’ve never written a work of fiction until now, but I do hope that you like it and that I have successfully channeled Mr. Ohno’s thinking. Hi Bob. Once again, thanks for your commitment and efforts. I often refer back to Mr. Ohno to keep myself grounded and centered. Dear Bob, Very insightful reasoning. Very True! In fact, many in today’s corporate world have no awareness about Mr. Taichi Ohno and have no clue about TPS. Your contributions are very valuable. I am looking forward to read your new book. Bob, I look forward to reading it. We’re all not going to become Toyota, but knowing the roots and foundation of what TPS and Lean are built on is very important. Lately, I have seen such a mash-up of ideas between Lean and Six Sigma that this “conversation” is needed. Thanks!